Title text: Don't forget the time you spend finding the chart to look up what you save. And the time spent reading this reminder about the time spent. And the time trying to figure out if either of those actually make sense. Remember, every second counts toward your life total, including these right now. The comic is a straightforward chart showing the amount of work (time) one can dedicate to making a task more efficient, in order not to spend more time optimizing the task than the total time saved. 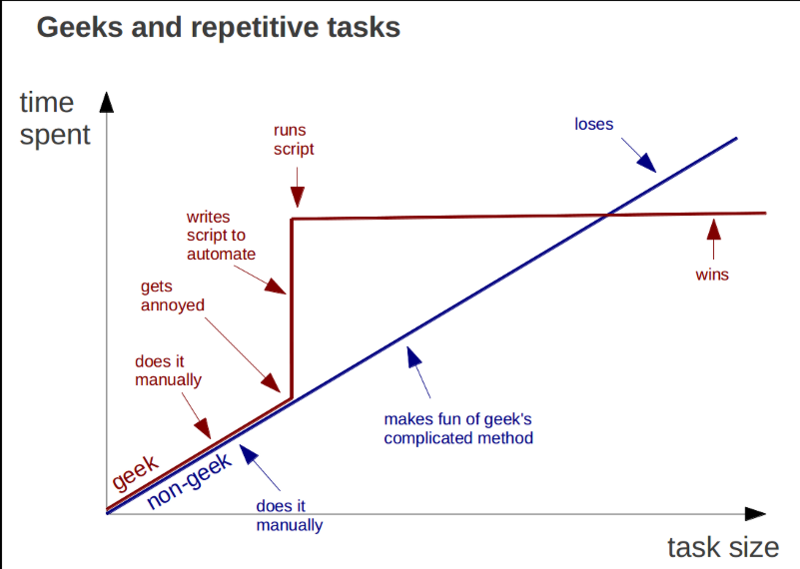 This may illustrate the fact that computer scientists often try to optimize tasks they are likely to perform again in the future - a common goal in their work - even though the work needed for that optimization can itself prove much longer than the time saved when doing the task again; this was previously referenced in 974: The General Problem. E.g. if you do some task every week once, and you are able to save 1 minute of time by doing some preparatory work (e.g. build or buy a tool), you can spend 4 hours doing this preparatory work, and you will, across five-years time, come even. Any less time spent doing the preparatory work, and you will profit from it. Therefore, 1 minute saved every week would, across five years, save over 4 hours of your time. Total time shaved off across 5 years = 5 × "How often you do the task every year" × "How much time you shave off"
The grayed out areas represent times which are either impossible to save, or where, if you could save this much (say 6 hours on one day), it would almost be worth it no matter how long it takes. For instance it is impossible to shave 1 hour off a task if you perform it more than 24 times a day – the total time shaved off per day would amount to more than one day, and thus you could not have performed the task this many times in a day to begin with. On the other hand, 6 hours shaved off for one day is not impossible, but the net benefit would be so great, that it would very quickly earn it self in again almost no matter how long it takes. If the assumption is that a work day is 8 hours, then even if it took 2 years to do the improvement, you would already have earned it in after less than five years in total - both with the 2 years to make it and the time it takes to save 2 years (2.67 years in this case for at total of 4.67 years). The comic assumes that equal amounts of time have equal value, which is not necessarily true. For an extreme example, consider programming a telephone with speed dials to be used when there is a fire or to call an ambulance or the police. This may take longer than the time saved when the call is placed, but it is worthwhile to spend a large amount of free time to save any time during an emergency. Of course, all these conclusions presume you are the only one that benefits. If the savings can be easily adapted by others - for example, computer code for a program that automates a task for hundreds of people - then the amount of time that can be spent increases. Indeed, in some cases, when optimizing for others, spending far more time than they save can be worth it, if the people you're working for are paying you for the product and the time savings keep them happy and likely to keep paying you. And if what you're optimizing is a business process that's unlikely to go out of date with your employer's current tools or its current products, then you may have more than 5 years to amortize the improvement. The comic derives humor from the absurd conclusions of hyper-efficiency, which have been examined in What if? - Cost of Pennies, and also in 951: Working which is devoted to insufficient economy, where the money saved is compared to the time wasted while looking for a bargain. In 1319: Automation Randall investigates how bad it really goes when you decide to automate a program to save you time... See also the Time management category. How many tasks that you were doing five years ago are you still doing? I'd give a max window of two years for most task executions. Whatever system you designed to save you time will itself require maintenance -- and become a task. Very few people can figure out when they start a time-saving task how long it will take. Once you create a time saving system, you are locked in to doing the task the way that the time saving system expects you to do it -- or, continually modify your time saving task, which again, takes time.